Woman Shot in Head: "It Still Feels Like It's a Dream"
The 26-year-old victim is recovering at home following Wednesday's incident. 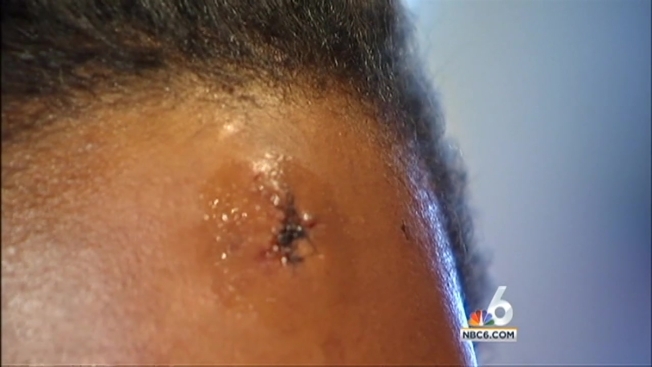 A 26-year-old woman who survived a shot to the head during an armed robbery outside her southwest Miami-Dade home shared her harrowing story Friday, saying the violent ordeal still feels like a dream. The woman was arriving home from work at about 12:26 a.m. Wednesday when she was attacked by a man brandishing a handgun. She told NBC 6 that she was about to put her key in the lock when she noticed a shadow and heard a man tell her to hand over her purse. Before she could respond, she said he was fired a warning shot and began pistol whipping her and kicking her in the head. That's when she felt a heat on her forehead. "I was like, Oh God. Please don't tell me I'm going to die tonight. Please don't let me die," she said. The commotion awoke her grandmother, who saw the man attack her granddaughter through the window. Thinking her granddaughter was dead, Althea McMillan hid in the closet and called 911. "Everything is silent. I just knew he had killed her," she recalled. But the woman was still alive, calling for her grandmother from outside the house. Forbes was transported to the hospital in critical condition, but later released. She's now recovering at home. "Now, it still feels like it's a dream, but when I look in the mirror I know that is really happened and I'm just grateful to be alive." she told NBC 6. "I know right now my family could be planning a funeral instead of being happy I'm still alive." The suspect left the scene in an unknown vehicle. Police ask that anyone with information about the incident calls CrimeStoppers at 305-471-TIPS.